Bullock trains were the semi-trailers of the 19th century. They carried wheat from farmers, wool from stations, timber from cutters and much much more. They had a language all their own and were very superstitious. If the moon did not appear behind a certain tree or a star did not appear at a certain location they thought that bad luck would follow them. 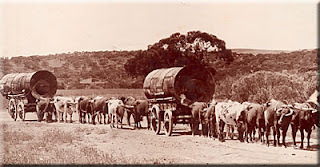 Bullock trains brought goods from large towns to the settlers and delivered the settlers' goods to the towns. They were the major source of transportation for country settlers. The average bullock train consisted of six to eight animals. The maximum load was 1.5 tonnes with a average speed was 3'/z miles per hour. Some teams had as many as 42 bullocks. waynemansfield.blogspot.com is very informative. The article is very professionally written. I enjoy reading waynemansfield.blogspot.com every day.